Lewisfield. Photo by Laurie Asseo. Contentious fields have been drawn for two sprint stakes at Monmouth Park June 17 as the MATCH Series enters its second round in two of five divisions. Both races are part of the free The Racing Biz handicapping contest taking place Sunday. The New Jersey racetrack will host the $75,000 Regret Stakes (Filly and Mare Sprint—Dirt Division) and $75,000 Mr. Prospector Stakes (3-Year-Olds and Up Sprint—Dirt Division) on a Sunday program with 13 races, four of them stakes. It should be a big weekend for Monmouth, which on June 14 launched its sports betting operation to a large crowd. The Father’s Day forecast calls for sunshine and high temperatures in the mid-70s on the Jersey Shore. The Regret is carded as the eighth race and the Mr. Prospector as the ninth. The Regret, at six furlongs, attracted eight fillies and mares including Startwithsilver, who finished a solid second behind Vertical Oak on a sloppy track at Pimlico Race Course in the May 18 Skipat Stakes, which kicked off the MATCH division. Owned by Iris Smith Stable, Lady Sheila Stable and trainer Linda Rice, Startwithsilver has three wins in five starts this year and prefers to come from off the pace in a race that could feature a hot pace. 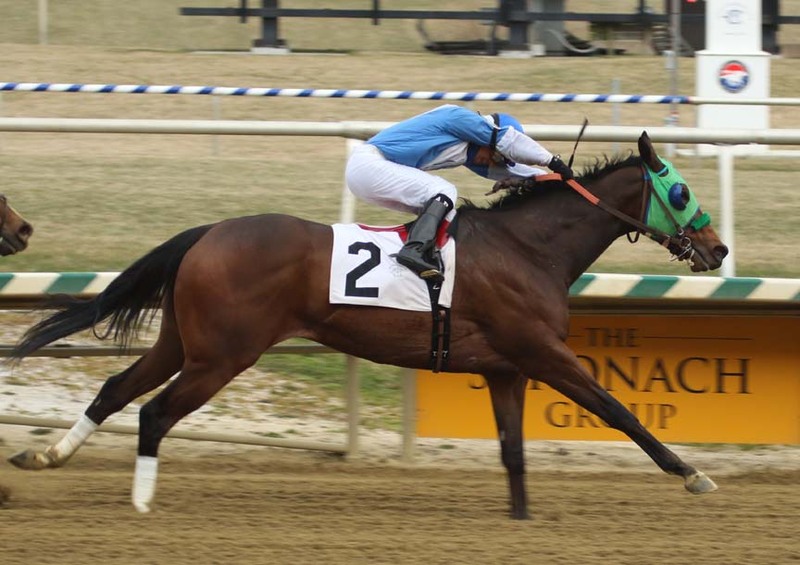 Linda Zang’s Lewisfield and Dun Roamin Farm and Wire To Wire Stable’s Irish Colonel, third and fourth, respectively, in the grade III Maryland Sprint Stakes May 19, are scheduled to return for the second race in their division. Lewisfield, trained by Jeff Runco, encountered early trouble but still made a good bid thereafter, while Irish Colonel, trained by Cathal Lynch, ran evenly throughout. Arnaldo Bocachica, the only jockey to have ridden Lewisfield in his eight starts thus far, has a return call. Jorge Vargas Jr., aboard Irish Colonel for his last two starts, is named again. Give his previous form it would appear that Al and Michelle Crawford Racing’s Delta Bluesman, conditioned by the meet’s leading trainer, Jorge Navarro, is the one to collar in the Mr. Prospector. The 8-year-old gelding was a blowout winner of an overnight stakes at Charles Town in April and has three wins in seven Monmouth outings; Lopez is named to ride. Maryland-breds also are in the running for end-of-series bonuses, and there are three in the Mr. Prospector: Lewisfield; Hillside Equestrian Meadows’ Laki, who finished sixth in the Maryland Sprint; and Larry Johnson’s It’s the Journey, who has two solid seconds and one third in stakes in his only appearances this year. New Jersey-bred Chublicious, a grade III winner owned by Brittlyn Stable, also is entered in the Mr. Prospector. An eight-time winner at Monmouth, the 7-year-old gelding finished second to Brother Chub, his full brother, in the restricted John J. Reilly Handicap in his last start in May. Brother Chub was nominated but not entered in the Mr. Prospector.